Renee Bennett (Schumer) is a fun girl. But she’s insecure. She’s a little more “curvy” than some women and, while attractive, doesn’t see herself as pretty. Some of this self-doubt comes from the fact that she works in the online department of one of the world’s largest makeup companies, whose spokesperson/owner (Williams) is the cover girl. Renee spends her free time with her friends Vivian (Aidy Bryant) and Jane (Busy Phillips) and, while the three aren’t setting any records with attracting men, they enjoy being together. One night, while watching the movie “Big,” Renee jokingly wishes she were beautiful. The next day, at a SPIN class, she falls and hits her head. When she comes to, she looks in a mirror and smiles. She IS beautiful. Though I’m still trying to figure out the message (Beauty is on the inside? Be careful of what you wish for? Be happy with who you are?) 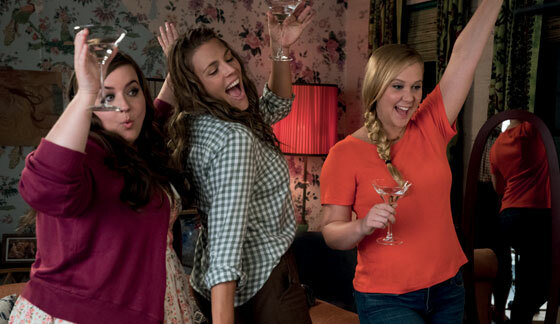 the film is trying to send, I found “I Feel Pretty” to be a funny film with a little bit of heart. Now that she’s “pretty,” Renee has the courage to apply for a job as receptionist of her company, a job she’s noticed is normally filled by amazingly beautiful women. Instead of being the woman who feels she’s five pounds too heavy, she sees herself as one of the beautiful people, giving herself the self-confidence she needs to not only get the job but flirt with the handsome brother of her boss. But soon she is self-absorbed with the idea of her beauty, abandoning her friends and climbing the social ladder. She doesn’t realize that it’s not her perceived looks that are getting her places, it’s her confidence in herself, and this is what impresses. The film is well cast, with Schumer striking all the right notes. This is not the raunchy Amy Schumer you may be familiar with. This version is a little tamer, but still fun loving. A scene where she impulsively enters a bikini contest, hiking her shorts and t-shirt up to expose her stomach, undulating to the music, is a moment of pure freedom. Williams, with a Jennifer Tilly-esque voice, is also well cast as a woman whose beauty doesn’t allow others to see how intelligent she is. Rory Scovel is Ethan, a man Renee meets “cute” at a coffee shop who falls in love with Renee the way she is, not the way she sees herself. And, my God, how is it that 74 year old Lauren Hutton is as beautiful today as she was when I was a teenager?? Directors/screenwriters Kohn and Silverstein, who previously gave us “Never Been Kissed” and “He’s Just Not That Into You,” do a fine job keeping the story moving in their feature directorial debut. I appreciate the fact that, even when she looks into a mirror, Schumer sees what we see – Amy Schumer – and not some high cheekboned model. Both Renee, and Schumer, are just fine the way they are. The screening will be held on Tuesday, April 17, 2018 at the B&B Overland Park Theatre in Overland Park, Kansas and will start at 7:00 p.m.
Tuesday, April 17, 2018 – 7:00 p.m.